While we were tracking a moose in the snow, we noticed urine dribbles along the tracks. Just wondering if a bull or a cow would do that? Thanks for the question Shawn. I didn't know the answer myself so I asked Dr Vince Crichton if he knew. "– it could be either – especially when stressed – I have a published paper of the H posture displayed by bulls and they do this when stressed – cows do not display the H posture but will squat a little and urinate – if they were not far ahead of you and perceived you were behind them, this is likely the reason for what you were observing – best I can do without seeing what you observed. I had seen this behavior in summer and have excellent video of it but was not able to observe them urinate until I saw it on snow in winter and the first time it was 2 or 3, 1.5 and 2.5 year old bulls that I was watching and they did it and I subsequently went to where they were standing and there it was clear as day . The late Tony Bubenik said it was only older animals that did this but that is not correct – I have seen young ones as well display this posture and likely about 1000 animals overall." 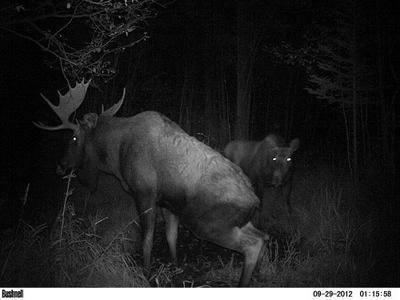 From doing a fair bit of tracking on deer, moose, and elk: dribbling urine randomly, or when they come across another set of tracks generally points towards a bull or a buck. A female will generally stop and squat to pee if you pay close attention to the tracks, a bull is more likely to "go on the go". Ironically the code word for this post happens to be "squirt".